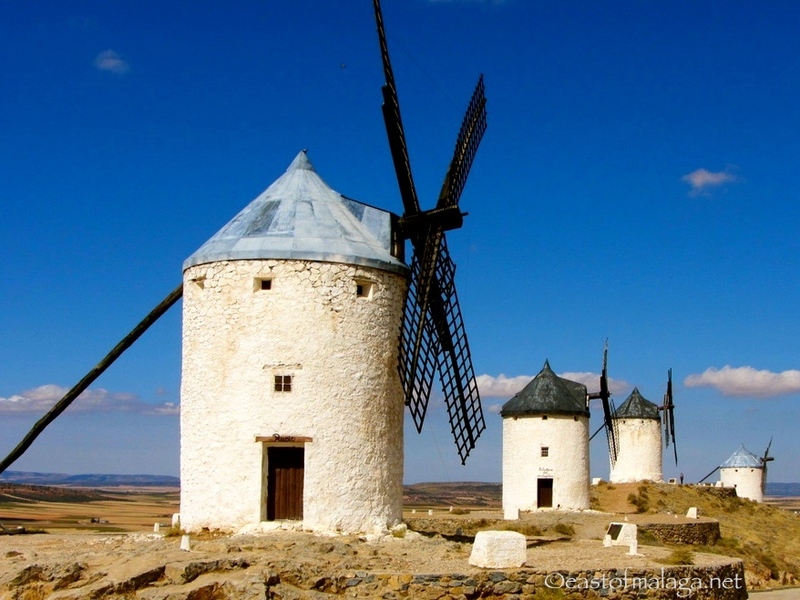 La Mancha‘s windmills were immortalised in Cervantes‘ novel, Don Quixote. These fine examples of restored Spanish windmills can be found in Consuegra, not far from Toledo in central Spain. Several mills spike the hill just outside of town and I certainly had some tilting to do, to capture not only the wooden sails, but also the magnificent blue of the wide open sky. This photo is my contribution to the Weekly Photo Challenge: Juxtaposition and Travel Theme: Wood. This entry was tagged Europe, photography, Post a week, Spain, travel, Travel theme, Weekly Photo challenge, windmills. Bookmark the permalink. Marianne, what beauties! Do you know approximately how old they are? I don’t know the exact date, Tricia, but these famous windmills were immortalized in Miguel Cervantes’ “Don Quixote”, which was published in two volumes in 1605 and 1615. So – sometime before then. They are certainly very old. The sky is stunning and the windmills are fabulous! Great shot, Marianne, but are three of those windmills being held up by sticks???? Nooooooo. That can’t be so. What is that? Those long poles are connected via a mechanism inside, through to the wooden sails, so that the sails can be turned around to face the wind. Efficient, huh? This is a wonderful picture – the blue sky is exquisite! I have never managed to read Don Q but your photo almost makes me want to give it another go. Great composition Marianne a really enchanting picture, I am halfway through Don Quixote ( phew) and this picture brings it to life. I find the name of that place quite funny. I wonder why they named it Consuegra. So different than the windmills of North America. Beautiful! Of course, these were originally used to mill grain, rather than the modern-day use of generating power. Yes, very pretty – and made all the more lovely as they each have a name such as Sancho, Mambrino or Bolero. You certainly achieved what you set out to do. A wonderful photograph. We see a whole stretch of them when we drive to and from Malaga/England – love them! Great job of tilting! We have wind generators new us but they are not nearly as beautiful as these. Thanks for your comment – much appreciated. That is beautiful scenery photo, Marianne! We saw windmills in Spain several years ago, and thought of Don Quixote. Fun post and beautiful pics. Whereabout’s Naomi? Were they these windmills? What a fab photos Marianne, they must be quite a sight.